"I have just been to see Her Majesty the Queen and I will now form a majority Conservative government. "I have been proud to lead the first coalition government in 70 years and I want to thank all those who worked so hard to make it a success, and in particular, on this day, Nick Clegg. "Elections can be bruising clashes of ideas and arguments and a lot of people who believe profoundly in public service have seen that service cut short. "Ed Miliband rang me this morning to wish me luck with the new government. It was a typically generous gesture from someone who is clearly in public service for all the right reasons. "The government I led did important work. It laid the foundations for a better future and now we must build on them. "I truly believe we are on the brink of something special in our country. We can make Britain a place where a good life is in reach for everyone who is willing to work and do the right thing. "Our manifesto is a manifesto for working people and as a majority government we will be able to deliver all of it. Indeed it is the reason why I think majority government is more accountable. "Three million apprenticeships, more help with childcare, helping 30m people cope with the cost of living by cutting their taxes. Building homes that people are able to buy and own. "Creating millions more jobs that give people the chance of a better future. And yes, we will deliver that in-out referendum on our future in Europe. "As we conduct this vital work we must ensure that we bring our country together. As I said in the small hours of this morning, we will govern as a party of one nation, one United Kingdom. That means ensuring this recovery reaches all parts of our country, from north to south, from east to west. "And indeed it means rebalancing our economy - building that northern powerhouse. It means giving everyone in our country a chance - so no matter where you're from, you have the opportunity to make the most of your life. "It means giving the poorest people the chance of training, a job, and hope for the future. It means that for children who don't get the best start in life, there must be the nursery education and good schooling that can transform their life chances. 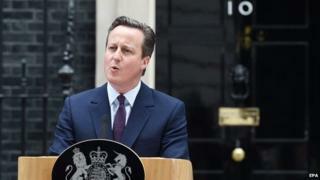 "And of course it means bringing together the different nations of our United Kingdom. I have always believed in governing with respect. That's why in the last parliament we devolved power to Scotland and Wales - and gave the people of Scotland a referendum on whether to stay inside the UK. "In this parliament, I will stay true to my word and implement as fast as I can the devolution that all parties agreed for Wales, Scotland, and Northern Ireland. Governing with respect means recognising that the different nations of our United Kingdom have their own governments, as well as the UK government. "Both are important and indeed with our plans the governments of these nations will become more powerful with wider responsibilities. In Scotland, our plans are to create the strongest devolved government anywhere in the world, with important powers over taxation. And no constitutional settlement will be complete if it did not offer also fairness to England. "When I stood here five years ago, our country was in the grip of an economic crisis. Five years on, Britain is so much stronger. But the real opportunities lie ahead. "Everything I have seen over the last five years, and indeed during this election campaign, has proved once again that this is a country with unrivalled skills and creativeness, a country with such good humour and such great compassion. "And I am convinced that if we draw on all of this, then we can take these islands, with our proud history, and build an even prouder future. "Together, we can make Great Britain greater still."